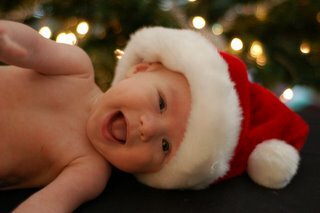 We took pictures of Dylan in front of the Christmas tree the other day. Julie came over to help us get some family shots, which we appreciated. Dylan was fussy for about 75% of the time, but once we popped in a Baby Einstein dvd, things got better. I never realized how hard it is to get a baby to cooperate during photo shoots, until now. Thankfully we have a digital camera. We take about 100 pictures and end up with about 2-3 that we like enough to have printed. What did people do before digital?!? We sold our couch and two chairs last week on ebay and the lady came by today to pick them up. It was kind of sad. We decided to wait before buying new couches for a few months until we are more settled, which means we are now going to be celebrating the holidays and Ryan's defense next month with no livingroom furniture. It should be interesting. We moved the glider rocking chair from the baby nursery into the living room so we have at least one nice chair to sit in. It feels strange now in there. I'm excited to get different (more comfortable) furniture in a few months, but nevertheless it feels strange to sit (on the floor) in an only partially furnished livingroom now. Today we ventured out to Chesterfield to work on some holiday shopping. Ryan, Dylan, and I left after Dylan's morning nap which should have been ideal timing for a not-so-fussy-baby. NOT. He was not a happy little boy. He either was needing a day at home inside where it was quiet and predictable, or was EXTREMELY irritated by the new winter bunting suit we bought him at Target last night. I'm not too sure he likes that new bunting suit. We might need to take it back. Hmmm. So anyways, after about 45 minutes of wandering through the store for gifts with a very unhappy baby, we decided to cut our losses and head home. I'm starting to think that ebay might be the best option now for shopping this year. I'm sure Dylan would agree with me.